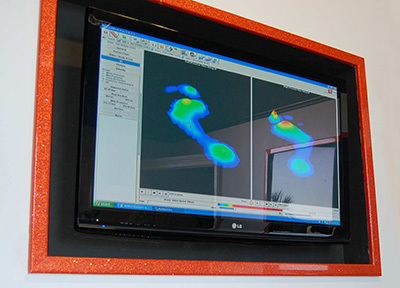 Why choose ProGait for your gait analysis? First of all your expert practitioner will take a detailed medical history alongside a history of your activities. This assessment is unique to you, and will be shaped by your history. There is no one size fits all at ProGait, everything is customised for you. You will then be clinically assessed for each of your joints from the hip to the toes, including all joints in the foot. During this assessment your practitioner will be giving you information about how your body works from a biomechanical perspective. Flexibility and quality of motion of joints will also be assessed. In the gait lab you will be video recorded from 4 sides on a treadmill. Its no ordinary treadmill, the sprintex is handbuilt, and designed specifically for orthopedic use to mimic natural motion. We use contemplas software for analysing and measuring the data from your visual analysis. Pressure plates will be used to measure the forces running through your feet as you walk/run/stand. This highly sophisticated equipment produces very clear graphical representations of the pressure at each part of the foot making it very easy for you to see where excessive forces are. The software also calculates where your centre of pressure is, maximum pressures, and other information such as how early your heel lifts in a step. The Pressure Plate Analysis is very simple. The Podiatrist will ask you to walk / run over the pressure plate one step at a time. He may also ask you to stand perfectly still on the pressure plate whilst the state of the art technology produces the results and relays them back through the computer for the Podiatrist to analyse. Video analysis has the benefit of allowing us to slow down time, freeze time and repeat time. Our state of the art software allows us to take measurement, track anatomical locations, ghost image layers and much more. Capturing your gait from all 4 sides gives the picture you need to analyse your gait. Our video analysis takes place on a handbuilt Sprintex treadmill, Designed for orthopaedic use and its ability to allow natural gait to happen with its unique track base. It is a very large substantial machine that can accommodate the fleetest of foot, and those with large stride lengths. Video gait analysis is a method used to assess the way we walk or run to highlight biomechanical abnormalities. A video gait analysis can take part on a treadmill or the Podiatrist may use force plates which can be used to measure the forces running through your feet as you walk/run/stand. Using state of the art equipment and software we can capture your movements and slow them down to study your movements in very fine details – movements which would perhaps be undetectable at a normal speed. From the results of your analysis we can look at the reason that you are getting injured, how to correct the problem and how to reduce the risk of any future injuries. It was a pleasant surprise to be offered a cup of tea and it made me feel right at home. I found my Functional Assessment fascinating! My ProGait Assessment was fantastic! After years of hardly being able to walk I finally feel optimistic that I have the answers that I am looking for and that I will start to get better. My husband found you on the internet and was very impressed with your website and the online booking facility. Orthotics to relieve stresses on tissues were the solution after detailed gait analysis. These orthotics were fitted to hiking boots and offer the stability and resilience required for challenging terrain. Are you about to take up a new sport, increase your training, change your activities? Changing the demands placed on the body is often the cause of injury. Changing demands can involve simply changing the surface you run on, or changing the shoes that you run in. Large changes to activity can often lead to problematic episodes of injury. Here at ProGait we advocate having your gait analysed before you embark upon any of these changes, so that you can get some sound professional advice to reduce the risk of injury. Excessive forces running through a joint with repetition can be a source of injury. We can analysed the direction of forces through joints with our motion analysis software, and measure the forces running through your feet with our high end pressure scanner. All of this will serve to produce a very detailed picture of your mechanics and allow us to produce a plan with the aim of reducing the risk of you suffering an injury. Feet have two main functions: adaption to terrain, and propulsion, with an aim to moving us as efficiently as possible. Depending on your foot type you may have an advantage in one of these at the cost of the other. Let us see if we can give you a competitive advantage in your sport. Your assessment can be very specific to your sport(s). Your movements will be quite different as a distance runner than a long jump athlete. Our state of the art equipment will allow us to study the forces running through your feet when they do the job you ask of them. As you will know even the smaller advantage can make a large improvement to your performance. We will analyse your mechanics in the finest detail and look for every opportunity to aid your performance. Our on-site physiotherapists have a wealth of experience of treating athletes and our on-site podiatrists are highly skilled in fitting and manufacture of specialist custom made orthotics. The orthotics are made on-site as you wait are completely custom made. This means that our podiatrists can fit them to almost any shoe so orthotics can be worn in dance shoes, running spikes, football boots, and much more. These orthotics will be made specifically for your sport, your feet, your mechanics, your shoes, and will be as unique as your fingerprints. Our complete assessment includes 4 sided slow motion video treadmill analysis, pressure plate analysis and a functional assessment by a Podiatrist. We use state of the art motion analysis software, and hand built orthopaedic treadmills which allow you to run with a natural motion. We will video you from all 4 sides, not just from behind. Our pressure plate system allows you to see the forces running through your feet. You will receive a report detailing all of the assessment findings and it will include a video CD-Rom of your gait analysis. Our experts will work with you to help you achieve your goals. Gait pathologies can often be successfully treated with exercise prescription, strengthening conditioning, sports physio rehab,orthotics or a combination of these. An accurate prescription orthotic can be made after our assessment, which is based on visual analysis and state of the art foot pressure mapping. At ProGait, we fit your custom made orthotics while you wait. We can make devices for running shoes, football boots, golf shoes, court shoes, pretty much any shoe with a heel cup, and as it is custom made, your comfort is assured.